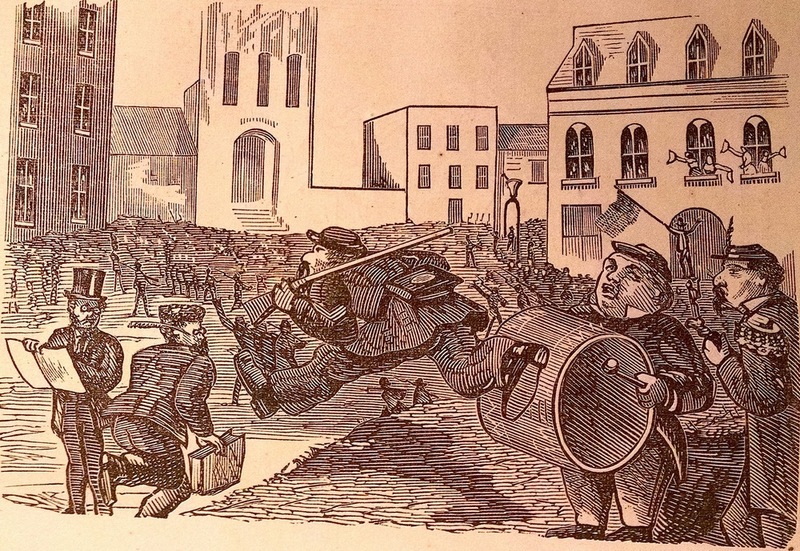 The slideshow gallery below presents a chronological series of comics, starting with the famous cartoons by Edward Jump in the 1860s, that feature depictions of Emperor Norton. The gallery is part of the Visual Arts section of The Emperor's Bridge Campaign's ARENA: Archive of Emperor Norton in Art, Music & Film. 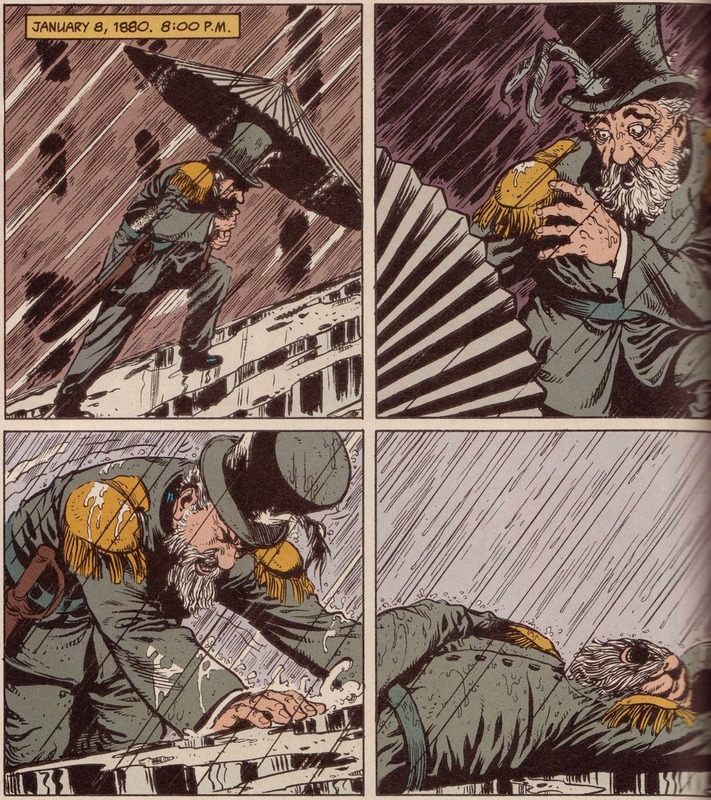 For comic strips that feature Emperor Norton as a recurring character, a single episode or frame is used as an example and, where possible, a link to a larger selection is provided. "Stock Brokers: And Still They Are Marching On" (c. 1861-63), by Edward Jump (1832-1883). Collection of the Bancroft Library at UC Bekeley. Source: Calisphere. "The Three Bummers," around February 1863, by Edward Jump (1832-1883). Collection of the Bancroft Library at UC Berkeley. Source: Weird California. "Funeral of Lazarus," October 1863, by Edward Jump (1832-1883). Collection of the Bancroft Library at UC Berkeley. Source: Wikipedia. 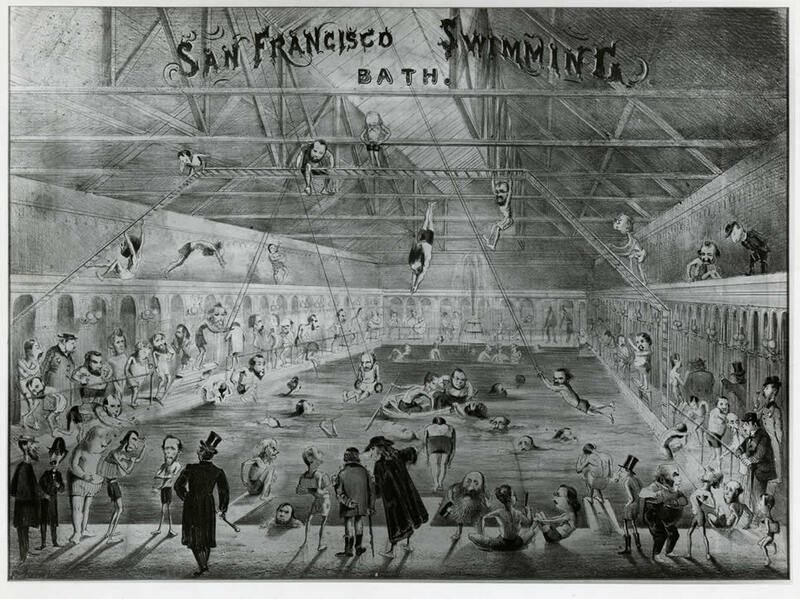 "Steamer Day in San Francisco," April 1866, by Edward Jump (1832-1883). Steamer Day — which occurred twice a month, once toward the middle of the month and once toward the end — was the day when bills were to be paid. 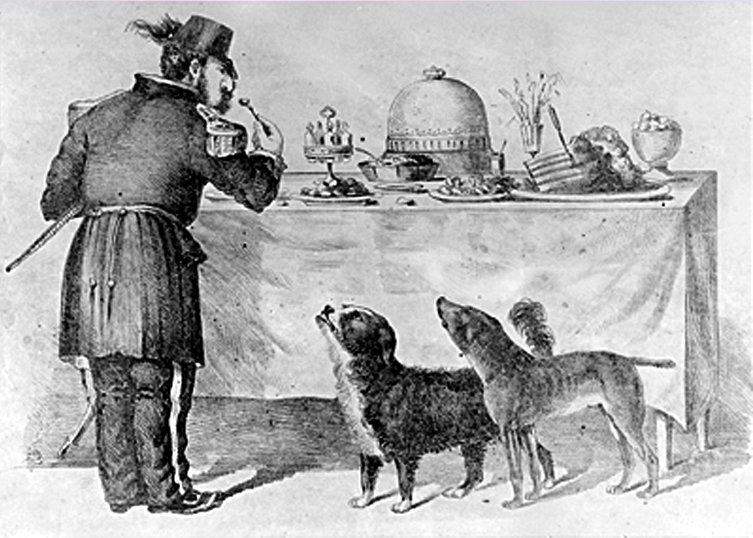 Hence, the humor that Jump found in depicting Emperor Norton showing empty pockets to an onlooking official. Collection of the Bancroft Library at UC Berkeley. Source: Calisphere. Comic, 1871, by John Steinberg. The comic appeared in a late 1871 issue of Frederick Marriott's California Mail Bag magazine, as part of a group of Steinberg's "Humorous Sketches of the War in Amador." Click image for the illustration with original captions. Photo: Taryn Edwards (from original document in the California State Library). Digital source: Internet Archive. Detail of comic, 1876, by George Frederick Keller (1846-c.1927). The comic appeared on the cover of the 9 December 1876 issue of The Wasp magazine. Click on image for the full cover, comic and captions. Source: Internet Archive. There Was a Reaper, and His Name Was Death, comic by George Frederick Keller (1846-1927). Cover illustration for the San Francisco Illustrated Wasp, V2 N81, 16 February 1878. Collection of the California State Library. Source: Internet Archive (click here for full cover and to enlarge with greatest clarity). Illustration, 1934, by John Hix (1907-1944). Part of a Strange As It Seems comic published on 22 April 1934. Comic created and drawn by John Hix. This image © 2016 Newspapers.com. Illustration, 1945, by Robert Ripley (1890-1949). Part of a Believe It Or Not comic published on 5 November 1945. Comic created and drawn by Robert Ripley. © 1945 King Features Syndicate, Inc. Image: eBay. Detail from the comic book, "Three Septembers and a January" (Sandman v2 n31, October 1991), written by Neil Gaiman (b. 1960) and drawn by Shawn McManus (b. 1958). © 1991 DC Comics. Source: Comic Vine. Scene from the comic book "Three Septembers and a January" (Sandman v2 n31, October 1991), written by Neil Gaiman (b. 1960) and drawn by Shawn McManus (b. 1958). © 1991 DC Comics. Source: Rachel Anne Calabia. Detail from Farley comic by Phil Frank (1943-2007), published on 13 September 2004 by the San Francisco Chronicle. © 2004 Phil Frank. For Frank's full 2004-5 series of Farley comics about Emperor Norton and the Bay Bridge, click here. "Emperor Norton," #184 in the Thinkin' Lincoln Webcomic series by Miles Grover. Other episodes featuring Emperor Norton are here. © 2006 Miles Grover. Source: Thinkin' Lincoln. Comic, 2007, by Kate Beaton (b. 1983). © 2007 Kate Beaton. Source: Hark! A Vagrant. Webcomic, 6 February 2016, for The New Adventures of Queen Victoria strip by Pab Sungenis (b. 1969). 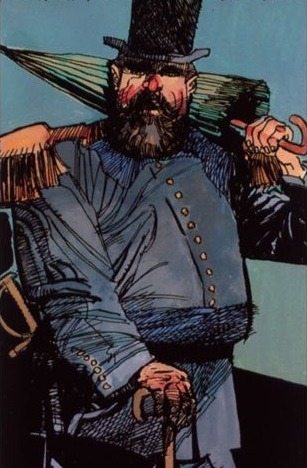 Emperor Norton is an occasionally recurring character in the comic, which is published here. © 2016 Creative Features. Source: Go Comics. Poster for 2014 Alternative Press Expo (2014), by Karl Christian Krumpholz. © 2014 Karl Christian Krumpholz. Source: Karl Christian Krumpholz. "Birth of a Bridge" (2014), by Francesca Testen (b. 2000). Commissioned by The Emperor's Bridge Campaign in connection with Testen's piece for the Campaign's Perspectives series. 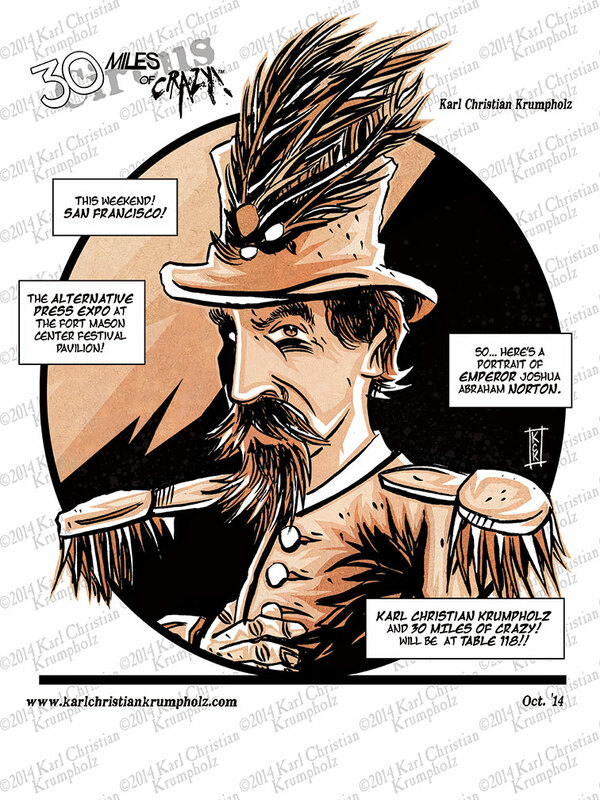 Testen's earlier "Emperor Norton" series for her webcomic The History Twins is here. © 2014 Francesca Testen. Source: The Emperor's Bridge Campaign.